How do Flip Flops Contribute to Slip and Fall Accidents? | San Bernardino Slip and Fall Attorney David H. Ricks of the Inland Empire Law Groups how you to understand how flip flops can contribute to slip and fall accidents. 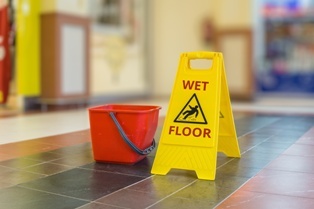 Slip and fall accidents and other premises liability incidents can cause lasting physical injuries—particularly when young children or elderly victims are involved. Fortunately, victims injured in California premises liability accidents caused by another person’s or entity's negligence may be entitled to compensation for damages from a fall or other injury causing event. A premises liability claim means an injury that occurred on another person's property. If you were injured in a premises liability accident and are considering taking legal action, avoid these common mistakes which could jeopardize your ability to collect a fair financial recovery. Regardless of whether the accident occurred in a grocery store, shopping mall, office building, parking lot, or apartment building, it's important to report the incident to the property or business manager, supervisor, or owner as soon as possible. Victims should also ask to complete an accident report and request a copy of that report for their records. Reporting the accident gets the incident on record, making it easier for you to file a personal injury insurance claim or lawsuit if you later choose to do so. It also may get the property owner to preserve evidence, such as saving a video recording of the incident. Many who fall are embarrassed of the fall itself and want to sweep the matter under the rug. They may even apologize for their own fall even though the fall was not their mistake. Likewise, angrily placing blame after an accident rarely helps anyone and can make an already tense situation even more contentious. It's better to say as little as possible, and let the other involved parties communicate with your attorney. Even if the circumstances of your premises liability accident seem clear, evidence supporting your claims can make an already strong case even stronger. Photos or videos of the accident scene, your injuries and the cause of the accident (if known) can be extremely helpful. Other important evidence available at the scene can include surveillance video footage, and witness statements and contact information. If you weren't taken to the hospital in an ambulance after your premises liability accident, you might think this means it isn't necessary to go see a doctor. That's a mistake—and one that can seriously cost you. Seeking prompt medical attention not only protects your health by assuring you don't have injuries, such as concussions or internal bleeding, but it also documents your accident and injuries as being related to the fall itself. Also, soft-tissue injuries are common after premises liability accidents; these injuries can take hours or even days to present. If you have to return to the doctor to report new symptoms, your doctor will also be able to link them to the recent accident in your records. When it comes to documenting premise liability accident-related injuries, going to the doctor just once is rarely—if ever—sufficient. It's important to keep your follow-up appointments with your doctor, and follow their treatment plan to the letter. If not, you run the risk of the insurance company or defense claiming that you're not doing your part to recover from your injuries. The insurance adjuster may make it sound like they want to resolve your claim quickly and fairly, but their loyalty is to the company's finances and not yours. Initially, providing a recorded statement to the insurance adjuster may seem like an easy way to jump-start your claim. Unfortunately, without first speaking with a lawyer, making a statement to the insurance company rarely benefits your claim. Recorded statements can be manipulated and used against you. If you misspeak—it can end up costing you. Speaking with a personal injury attorney can help you understand what you should—and shouldn't—say during such a statement. A business, insurance company, or property owner may claim they're looking out for your interests by offering a quick settlement, but the only way to find out if the settlement is fair to you is by speaking with a qualified personal injury attorney. Don't accept a first offer, it is rarely the true value of your case. If you were hurt in a premises liability accident, the Rancho Cucamonga CA slip and fall attorneys with the Inland Empire Law Group can help. Contact us today at (888) 694-3529 to schedule an appointment for a free, no-obligation initial case consultation.